"N" is for nerdy cosplay people. "What's in your Nordic Norwegian Neanderthal wallet?" No haiku just using"n" words? Hey! They just believed in "income redistribution"! 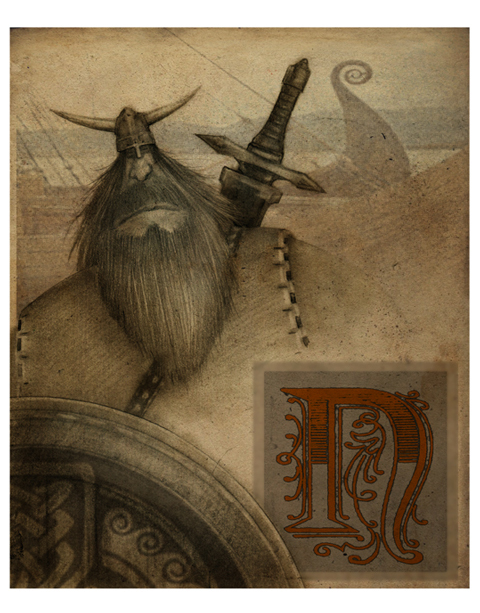 Viking starts with letter "V"
Tired of these mnemonics yet? Well--you just learned your "M"
He'll tell you what follows is "N"
could i pay for an alphabet book like this? Yeah, I think this arty concept for a ABC book could work nicely. You'll be the first to know about it when I get to it. You can't do a haiku using only "n" words. That would be extremely racist. It's also a mathematical impossibility. You can't do a haiku using only two-syllable words. ... & I wish I had thought of "Njord the Norman." This page contains a single entry from the blog posted on April 5, 2013 12:03 AM. The previous post in this blog was Kim Jong Unabashed. The next post in this blog is For Devon.